Becoming the normal, creative directors Maria Grazia Chiuri and Pierpaolo Piccioli brought out their “references” again this season. The house of Valentino based it’s show on the experiences of a world traveler by showing “a multicultural style concept”. This involved mixing military and sailor looks, couture with jeans and Hawaiian shirts, sandals and signature trainers, the eclectic traveler was born. “Cultures become one culture—that’s what we find exciting” said Chiuri backstage.We loved the fun guitar straps on backpacks, souvenir jackets that were key for the season in a bold jacquard fabric. The military like, sly punk was shown in key looks as well as the passion for reconstructed denim. 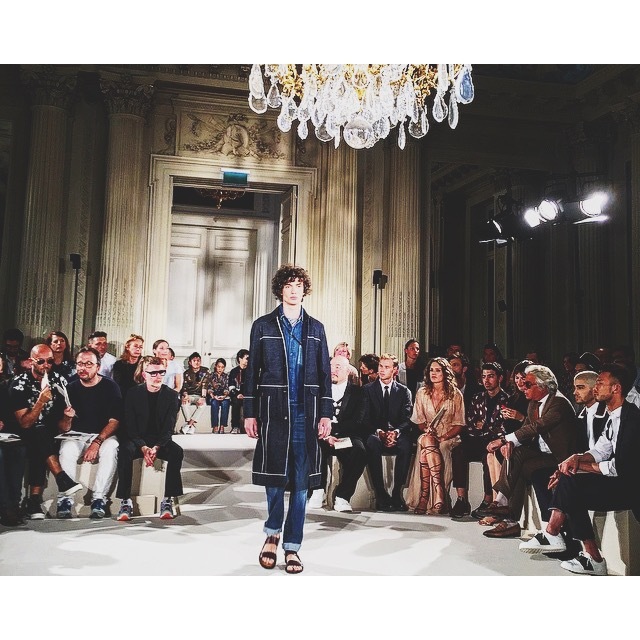 I’ve officially fallen in love with the Valentino boy – be mine? This entry was posted in Trend Reports and tagged Maria Grazia Chiuri, menswear, Pier Paolo Piccioli, SS16, style, valentino. Bookmark the permalink.